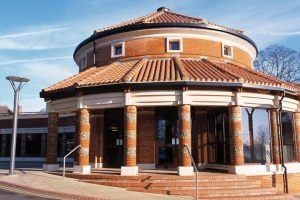 Verulamium Museum is a pretty good sized museum with the district council of the Verulamium Park in charge which is beside St. Michael’s Church. The museum is home to all kinds of exhibits which include Roman settlement items, Iron Age artifacts, information regarding Hertfordshire, as well as Roman history. It all began when Mortimer Wheeler and Tessa Wheeler (his wife) was performing excavations in the 1930’s. They discovered a variety of items include colorful mosaics of various sizes, coins, tools, jewelry, pottery, and many other artifacts many from the Roman era. Some of the items were actually found in a coffin that contained a male skeleton during the time while a building was being constructed nearby. The museum is known for offering the largest collection of Roman artifacts in the nation and even won for is domed entrance an architectural award. At one time, Verulamium w as actually one of the largest towns in Rome coming in at number 3. This museum sits on the exact site of the town. Inside the Verulamium Museum you and your family will enjoy various hands-on discovery sections, roman rooms that have been recreated, a collection of gold coins the Romans used in the Sandridge Hoard section, several of the most famous wall mosaics as well as wall plasters in all of the Mediterranean area, and even a video that explains and shows the excavations. The museum offers many different family activities throughout the year. The hours of operations are Mondays through Saturdays 10 am to 5:30 pm with the last visitors being allowed in at 5 pm. Sundays, the museum is open from 2 pm until 5:30 pm, with the same rule applied as when the last visitor may enter. Of course, the museum is not open on holidays such as New Year’s, Christmas and bank holidays.